An honest man is made of great morals. He is honest not because he never got any opportunity to cheat but he believes that honesty is the best policy. Such a man not only does good to other people but creates a belief of God in others. There are many who with ample amount of money show dishonesty and at the same time there are people who with little money yet they never abandon honesty. We have one such story of Ashish Talwadi, an Infibeam employee who lives on daily wages and manages to make approximately Rs 13,000 in a month. However he displayed immense honesty when he returned Rs 74,000 that he had mistakenly got from a customer, who paid extra over the bill amount. This amount would have made a great difference in his life as could have afforded a better treatment for his two-year old daughter. Ashwin is a driver with Infibeam Logistics delivering orders of Fortune Online. On one of his delivery errand he delivered two 25 kg rice bags and five tin cans of sunflower oil to a customer in Paldi. “The amount of the bill to be charged was Rs 12,184. But the customer was busy on a call discussing her daughters’s health. She handed over the bill amount to me and at the same time I got a call from my wife and she asked me to rush to Sola Civil Hospital to see our daughter who suddenly fell ill. 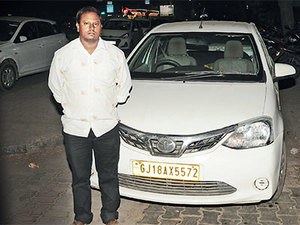 I quickly collected the bill amount and rushed to do three more deliveries,” described Ashwin. After completing the deliveries when Ashwin returned home and heard from his sister that his daughter was in better condition and was sleeping he felt relaxed. Like everyday, Ashwin handed over the amount to his dad with all the bills of the day to count. But surprisingly his dad after counting the amount said that the bag has additional Rs 74,000. Both father and son separately counted the money and made sure there was no mistake. Ashwin recalling the whole incident realised that instead of bundles of Rs 10 and Rs 20, the customer had given him five bundles of 100 and six bundles of 50. Ashwin immediately called up his operations manager and informed him of the situation. After getting instructions from his manger he brought the excess money to his Satellite office. Meanwhile they also contacted the customer asking if she was aware of the excessive payment she made on the bill. The customer had no idea about her mistake. Both Ashwin and the manager went to her house and returned the extra money. The customer didn’t reveal her identity but thanked Ashwin and Infibeam for their honest gesture and added that it is hard to find such kind of people in today's time. Infibeam family is truly thankful to Ashwin and will recognise his gesture. He will also be facilitated by the company in coming days.